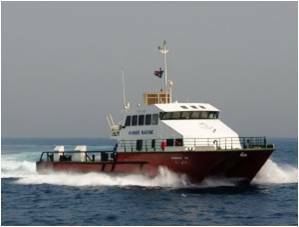 Designers of innovative and functional, high performance commercial, offshore and patrol vessels, Teknicraft Design have satisfied clients right across Africa, the Middle-East, the Americas, the Pacific and Europe. 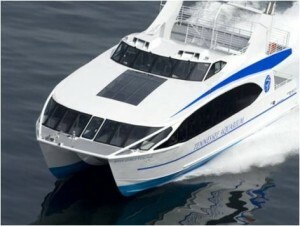 Their acclaimed hull technology is an advanced semi-planing type catamaran with a special combination of multi-stepped, symmetrical and asymmetrical sponson shapes that combine the very best attributes of both shapes in one unique and outstanding hull. The symmetrical bow-section ensures directional stability in short swell conditions and following seas while the asymmetrical midships and aft sections ensure softness of ride and reduced wetted area which improves performance, economy and comfort. The hull has a high tunnel ceiling and large opening between the sponsons which keeps slamming to a minimum for increased economy and passenger comfort while carefully designed steps on the inside of the tunnel walls deflect green water away from the hull. The critically placed longitudinal chines inside the tunnel and asymmetric chines on the outside further reduce the resistance of the hull. The vertical inside edge of each sponson minimizes wave interference between them, further reducing drag. 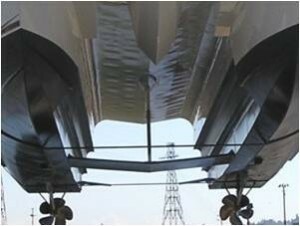 The combined effect is a hull with low resistance, low vertical accelerations and excellent performance. Another special feature of the Teknicraft hull design is that the vessel banks inwards on turning, similar to a monohull, increasing high speed turning performance, safety and passenger comfort. Hull performance is even further boosted through advanced use of Teknicraft’s adjustable hydrofoil technology; a combination of specialised underwater wings and interceptors significantly reduce hull resistance, increasing speed and load-bearing capability of the craft. 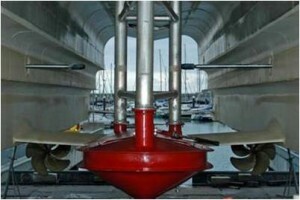 The hydrofoil is fixed above the keels of the sponsons and is therefore no more vulnerable to damage than the hull itself. This advanced design feature further reduces hull resistance which requires less power and so less fuel to reach service speed…while higher service speeds can be achieved without sacrificing fuel economy. 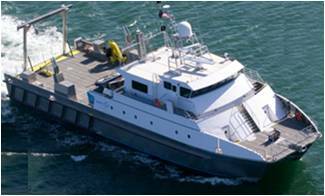 An outstanding quality of the Teknicraft hull is its ability to maintain high speed in rough water conditions making it particularly well suited for naval, crew transfer, survey and ferry duties when the all-weather performance of the craft and comfort of passengers is a business-critical factor. 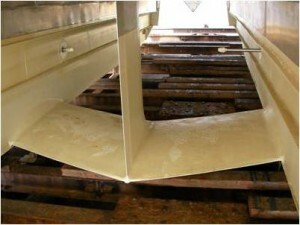 An outstanding feature of this hull-form is its soft riding characteristic with reduced vertical acceleration forces. 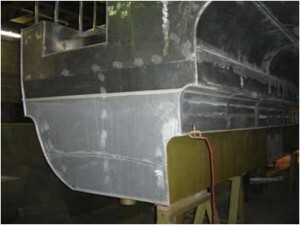 The combination of advanced hull shape, specially designed chines and foil technologies produce its characteristic soft ride, with the resulting mixture of spray and air creating a high-density cushion inside the tunnel further dampening and smoothing motions each time the hull moves through a trough of a wave. Since vertical accelerations on this type of hull is lower than most other types of craft, the Teknicraft hull can maintain service speeds in relatively rough conditions without compromising the comfort of its passengers. Teknicraft advanced hull designs are exclusively combined with our advanced propulsion and stabiliser technologies to give Missionkraft vessels the highest levels of lifetime performance, comfort and cost effectiveness. Missionkraft are proud partners of Teknicraft Design. 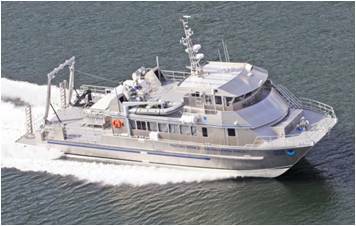 Teknicraft and the Teknikraft Design logo are trademarks of Teknicraft Design Limited and vessels illustrated throughout this site have been manufactured with pride by leading shipbuilders including Q-West, Nico, All American Marine and Veecrraft to Teknicraft designs.